Dayton Elementary School is located in Dayton , Nevada . This school is a public school with grade levels Kindergarten through Fifth. Riverview Elementary School is located in Dayton , Nevada . This school is a public school with grade levels Kindergarten through Fifth. Sutro Elementary School is located in Dayton , Nevada . This school is a public school with grade levels Kindergarten through Fifth. Dayton Intermediate is located in Dayton , Nevada . This school is a public school with grade levels Sixth through Eighth. Dayton High School is located in Dayton , Nevada . This school is a public school with grade levels Ninth through Twelfth. 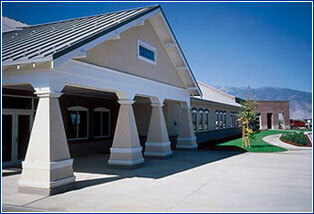 Silver State Charter School is located in Carson City, Nevada and serves Dayton as well. This school is a free, public online and on-campus serving grade levels Seventh through Twelfth. 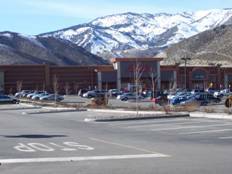 Bishop Manogue High School is located at 400 Bartlett Street in Reno , NV and is a Private School with grade levels Ninth through Twelfth. Sage Ridge School is located at 2515 Crossbow Court , Reno and is a Private School with grade levels Sixth through Ninth . Faith Christian Academy is located in Gardnerville , NV and is a private school with grade levels Kindergarten through Sixth. Not only is Nevada the fastest growing state in the Nation for the 19 straight year, but Lyon County is still the fastest growing county in the state for the 2 nd straight year. The highest concentration of growth within Lyon County centers around the city of Dayton which has seen a consistent population growth of 39% since 2000. With continued expectations of the same growth larger residential home builders are starting to take notice. Lennar, Reynen & Bardis and Centex Homes are a few of the latest Builders to move into the area. Nevada also boasts one of the lowest unemployment rates consistently beating the national average for the past 5 years. With a new economic life emerging from within the entire northern Nevada, the town of Dayton and the surrounding community is quickly realizing how historically rich and beautifully diverse it is. To view the 2006 census and demographic data for Dayton please reference and click on the map below. You’ll find some of Nevada ‘s most impressive venues scattered throughout Golf Digest’s list of America ‘s 100 Greatest Public Courses. Shadow Creek. Wolf Creek . Edgewood . Cascata. Reflection Bay . If you’ve ever played these courses, you’ll know that public can also mean exquisite, breathtaking, inspirational or even divine. And if you haven’t played them, what are you waiting for? 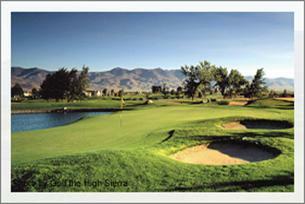 No question, Nevada ‘s golf courses are as challenging as they are spectacular. And without doubt, this is due in no small part to the state’s daunting landscapes and sheer physical beauty. 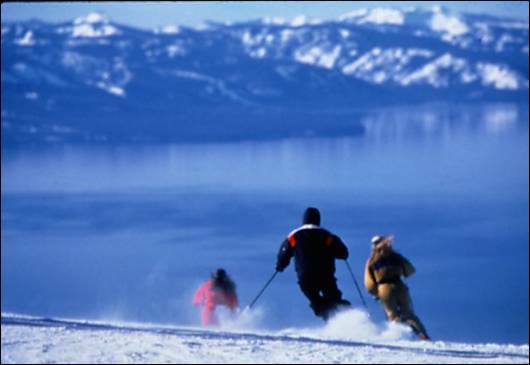 Take the Montreux Golf and Country Club, for example, a private paradise and home of the Reno-Tahoe Open. Or the Edgewood Tahoe, where the American Century Celebrity Golf Championship is played. These are no ordinary courses. They are man-made works of art, painstakingly designed to complement Mother Nature’s own miracles. 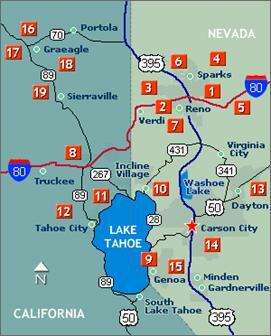 And don’t miss The Divine 9 around Carson City , each course more heavenly than the next.